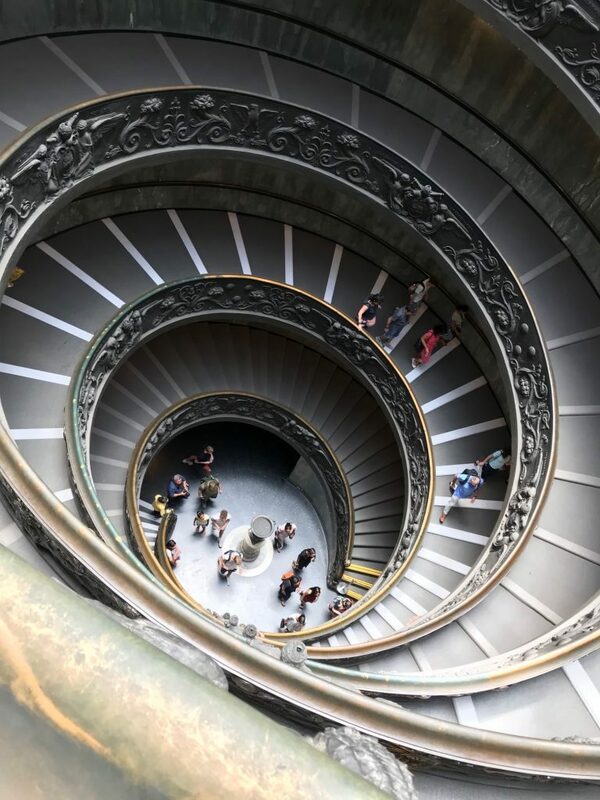 Visiting the Vatican Museums, what to see and how to book to skip the line! Visiting the Vatican Museums in Rome. I have always wanted to visit the Vatican Museums. And, finally, I recently treated myself to a day visiting the Vatican Museums. The museum is so huge that no matter how many times you go, something will impress you that you didn’t catch before. I like to take a whole day for museums like this, starting in the early morning, to be sure that I have all the time I need to enjoy the visit completely. The large spiral staircase after the entrance leads visitors who have finished seeing the museum to the exit, and adds to the feel of commanding importance. 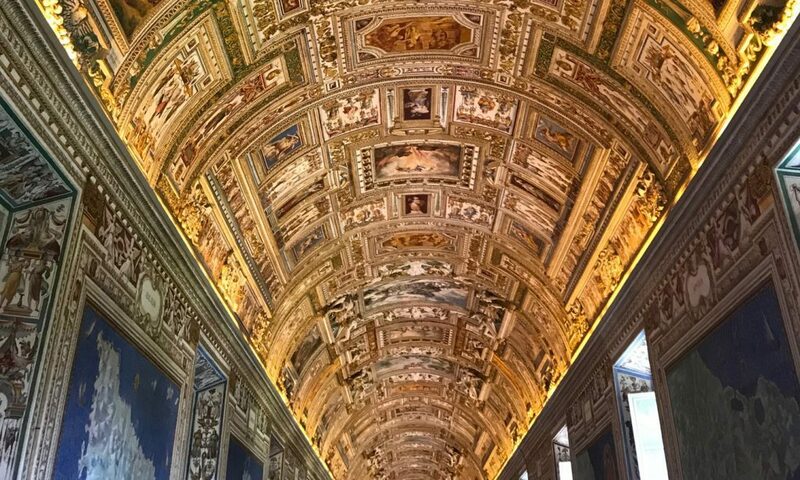 Visitors are awed by it, aware that they are in the presence of Art with a capital A, collected and protected by popes over the centuries who sought to preserve this beauty for those who came after them. 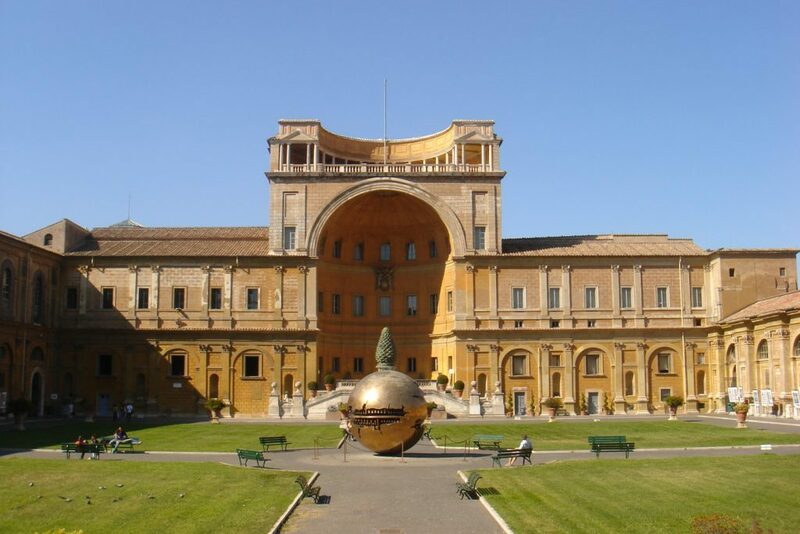 The Vatican Museums are actually several museums and collections gathered together. In this post, I’ll talk about the sections and art works that struck me the most. 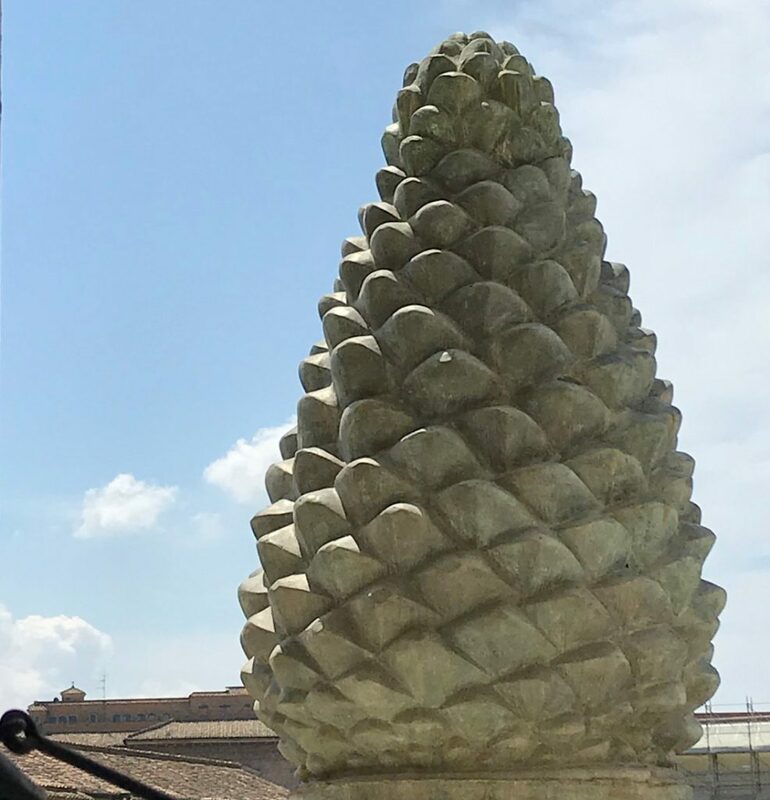 The first place that will be sure to impress visitors is the Cortile della Pigna (“Pine Cone Courtyard”): named for the enormous 4-meter-high bronze sculpture, guarded by two ancient bronze lions. Take the time to snap a picture in this spot! 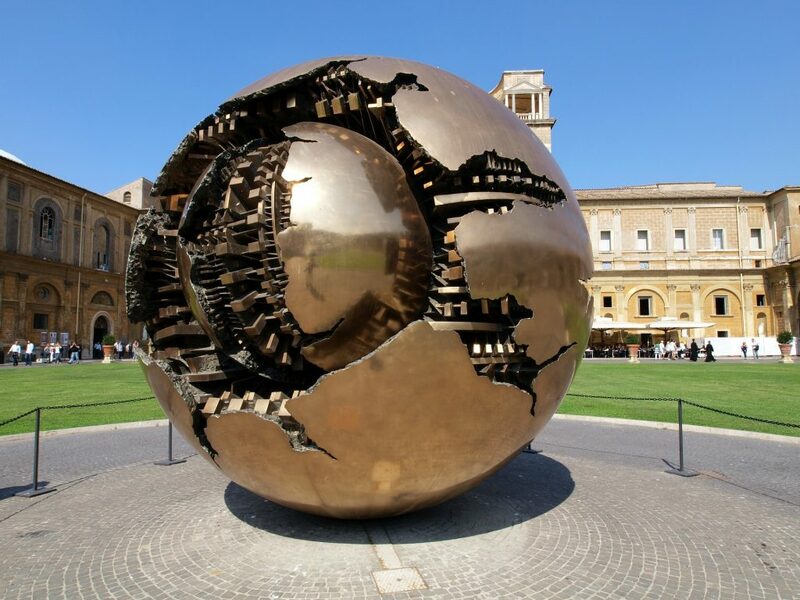 There’s also another sculpture — a decidedly more modern one — that draws visitors’ attention in the Cortile della Pigna: Arnaldo Pomodoro’s circular sphere. on the outside it is smooth and perfect and inside it reveals a complex mechanism that moves just slightly in the wind. The sculpture instills a great feeling of pride in our homegrown art: Arnaldo Pomodoro is a world-renowned sculptor. Think that his sculptures stand in front of ultra-prestigious buildings wordwide, like Trinity College in Dublin, the Ministry of Foreign Affairs in Rome, and the Unesco headquarters in Paris, just to name a few. The courtyard’s two sculptures, the pine cone and the sphere, are both made of bronze, testaments to a wonderful continuum between the art of the past and that of the present. 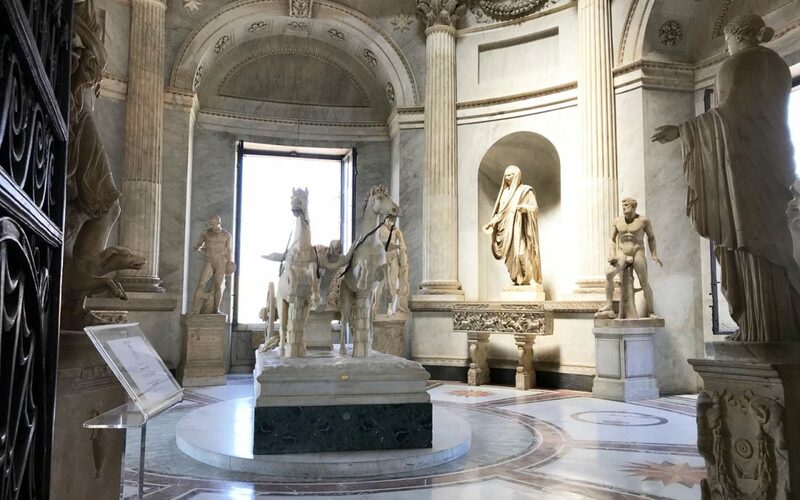 Visiting the Vatican Museums: Up to the first floor and the galleries! Inside the museum, I find more things to marvel at: one of its most interesting parts is the Map Gallery. I suggest spending extra time here, especially if you are going with kids. They’ll have lots of good educational fun finding the region they come from or even their city! This is a collection of forty maps hanging on the walls of the long, elaborately decorated gallery. 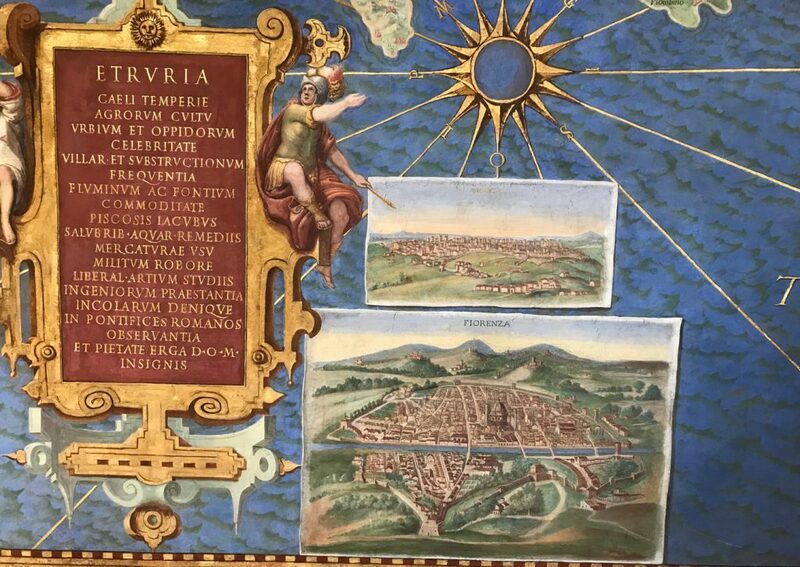 These maps give a glimpse of how Italy was seen in the 1580s. The highly detailed maps show both capital cities and small towns in the same style. It was quite exciting seeing my little homeland island shown on the map! After the Map Gallery, the Raphael Rooms are the part of museum that leaves the most vivid impression. Pope Julius II della Rovere chose a master no less than Raphael to decorate his apartments. 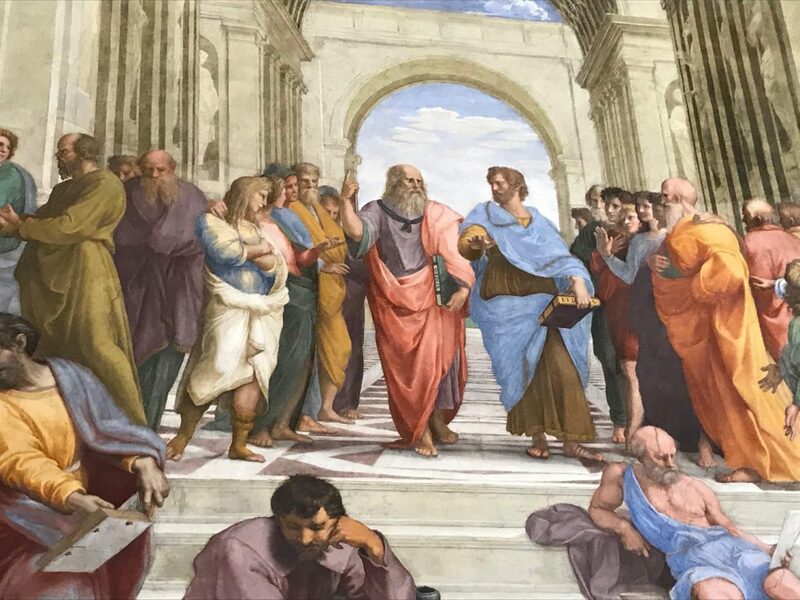 On one wall, Raphael painted the world-renowned School of Athens, depicting antiquity’s most famous thinkers, mathematicians, and philosophers, engrossed in conversations with each other and their students. Though it’s not easy to spot them all, a good guide will help you pick out Alexander the Great, Leonardo da Vinci, Pythagoras, Socrates, Euclid, Archimedes, and Hypatia. Raphael, with a healthy dose of well-deserved self-esteem, included himself among the greats with a famous self-portrait in which he straight at the viewers with a complicit gaze now suspended in time forever. The exciting high point of this artistic journey is at the end of the museum visitor route when a small door opens to the thrilling Sistine Chapel. The Sistine Chapel is truly indescribable. Of course, we can detail the frescoes with which Michelangelo covered the walls and how and where the Last Judgment is placed, and the layout Michelangelo used for the painting. But it is not humanly possible to convey the profound emotion you feel when you look at the most impressive art work in the world. There’s nothing to be done but simply sit quietly and admire it. My visit to the Vatican Museums ends here, and I’m tired but really happy about my visit. I’ll leave you with a few tips if you’re planning on visit it. Plan well for your trip to visit the Vatican Museums. In the summer it is super hot so consider getting there early. Your visit will be at least 3 hours long. So, plan a half day for it. Dress comfortably. Women should cover their shoulders and men should wear long pants. The Sistine Chapel is consecrated, and clothing should be appropriate for a church. There is a lot of walking to do inside, so make sure and wear comfortable shoes. 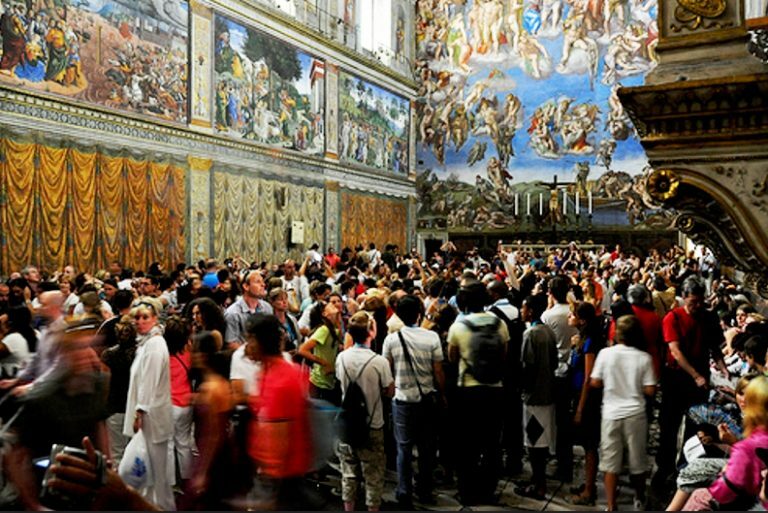 Book your entry tickets to the Vatican Museums. The line is always really long at the ticket office, especially from March to November and, without reservations, you could risk spending up to 3 hours in line under the sun. 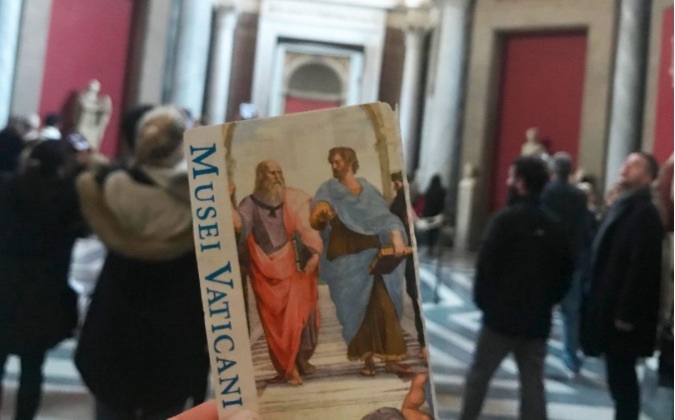 If you want to get better oriented, you could get the Vatican Museums ticket with an audio guide. The guide can help you get around more easily and appreciate the works accompanied by the commentary. There are several cafés and eating spots inside the Vatican Museums but lines are long here too. Get some water before you start the visit. There are vending machines on the ground floor, near the ticket office. Leave your heavy bags at the bag check. It’s a long tour and you don’t want to be weighed down! In my next post, I’ll tell you about my experience at Nero’s Domus Aurea! From religious Rome to pagan Ancient Rome!